Leticia was your definition of beauty with a very straight figure – slim and alluring, her legs so long and attractive, she has a stunning beauty and with her great fashion sense she could get heads turning. It wasn’t just about beauty she is very intelligent too which explains her growth in the banking sector she was employed as a customer care representative but in three years she became a branch manager. As for love Leticia was not so lucky in that department so she embraced her career and hoped that one day her turn would come. Her mother never stopped reminding her that marriage is very important. Jimi was a young entrepreneur with so much strength, he is very passionate about his business and it’s not surprising his wealth is multiplying daily. This particular day he woke up very angry his accountant had complained about a particular sum of money he was supposed to send into the company’s account. He made the transfer using his token, he was debited but the money was not received in the company’s account, it’s been five days. He hated visiting the bank but he had to go as the money was urgent, he met with the customer care representative who told him it would take seven (7) working days this got him angry and he insisted on speaking with the branch manager. He was ushered into Leticia’s office, something about her caught his attention. Was it her calmness or her patience or her genuine concern? He couldn’t place it but he knew he had to get close to her. They exchanged contacts and they became friends. Six months later, they started dating and they were so in love. There was a particular they decided to grab some groceries at the nearest supermarket it was there Leticia saw her old friend Matthew. She was excited when she saw him, he left the country in their third year in the university, and she hugged him and introduced him to Jimi. She chatted with him for a while and went back to Jimi. On Jimi’s end he was angry why would she hug another guy and even chat with him. This is not the first time Leticia had had to greet a male friend and Jimi would be angry but this time around he was mad. Immediately they got back to the car he slapped her. He claimed she disrespected him by hugging another man. Leticia made up her mind to break up with him but he came back begging and because she loved him she forgave him. Two months later they got married and the monster in Jimi came alive, he beat her up at any slight provocation, he made her resign from her job and Leticia became a shadow of herself. If only someone had told her about love and marriage, if only she knew what it takes to get a good man she would not be deceived by that fake smile and all the fancy gifts. She was hoping her divorce would work out but until then the universe was definitely against her. Don’t be like Leticia, I’ve meant singles whose requirement for marriage baffles me. As long as the man has enough money character is a small thing or as long as she is pretty character is minimal. Who gave you that analogy? Marriage is real work and it takes beyond beauty and even love to have a good home. Divorce rate keeps getting higher and I wonder why? A lot of people are married and they are not happy everyday feels like hell and I discover one major reason and the bible has said it all. Hosea 4:6a says “My people perish for lack of Knowledge”. KNOWLEDGE is very important. Marriage is not a place you enter into with assumed knowledge you really need to know. 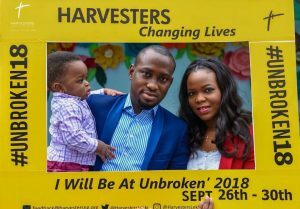 This is why I’m inviting you for UNBROKEN CONFRENCE 2018 at the Harvesters International Christian Centre Lekki. 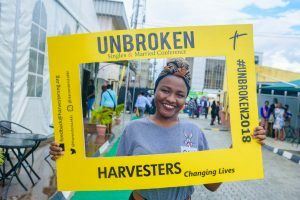 Unbroken is the annual singles and married conference of the Harvesters church, the vision was birthed 3 years ago to help change lives and cause fulfillment in relationships. With the increasing rates of divorce and separations, dysfunctional homes, marital and relationship unfulfilment, broken relationships and emotionally bruised people, a swift and effective aid must come to the institution of marriage and relationships. Since its debut, UNBROKEN has significantly contributed to increasingly successful relationships, happier marriages, building Godly homes and UNBROKEN 2018 promises to be even richer as seemingly complex topics will be unraveled. Why am I sill single? Why bad girls get good guys? Can my marriage still work? How to make your partner happy. Navigating through the first 5 years of marriage. Parenting in a tech-driven world. The line of speakers are amazing. We have Ezekiel Atang, Hassani Pettiford, Mowumi Idowu and Bolaji Idowu. The venue is at Harvesters International Christian Centre Lekki, Block 94, Plot 22 Providence street (beside VFS) 2nd Round about Lekki Phase 1 Lagos. The date is September 26th -30th 2018.